Invented in 1964 by entomologist Robert Goulding, Jr., the flea collar is one of the most readily available forms of flea treatment for cats. Usually made from plastic resin and infused with an insecticide or combination of insecticides, flea collars are inexpensive, simple to use, and relatively effective for repelling and killing adult fleas. In a world of diverse and often easy-to-access flea treatments for cats, flea collars are no longer the best option for most guardians. In this article, we’ll explore the different types of flea collars on the market, learn whether or not they’re safe, and investigate what differentiates them from other flea treatments. There’s only one flea collar that’s consistently recommended by veterinarians and appreciated by cat guardians at the same time. If you want to skip to our number one choice for the best flea collar for cats, scroll to the bottom of the page. These collars release insecticides in a gaseous form. Most veterinarians don’t like these flea collars and describe them as ineffective. They emit gases from your cat’s neck area and have a limited range, sometimes not spreading all the way across your cat’s body to their hindquarters, where fleas tend to concentrate. These collars release small amounts of insecticides across your cat’s skin. The insecticides seep down into the hair follicles and sebaceous glands, turning your cat’s skin and coat into an insecticide minefield for any fleas that try to take a sip of their blood. These are usually considered the most effective type of flea collar for cats. They kill adult fleas and protect your cat from newcomers for 7-9 months. In most cases, flea collars are only effective for killing adult fleas. Some, however, contain insect growth regulators – also known as IGR’s – which prevent fleas from reaching maturity and reproducing. If you’re concerned about the toxicity of conventional collars made with chemical insecticides, you might opt for a so-called natural or herbal flea collar instead. 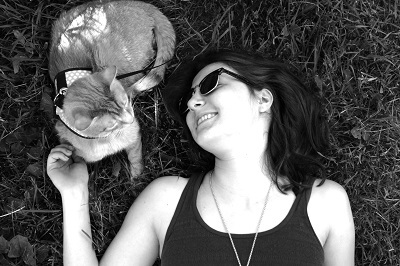 Dr. Brodie’s recommendation is echoed by most other veterinarians and cat guardians. These collars have limited effectiveness and sometimes do more harm than good. Back in the ‘60s, a space-age concept was born – a flea collar that, instead of using insecticides to deter and destroy fleas, emits a high-frequency noise – 20 to 60 kHz. Theoretically, this sound sends fleas packing. 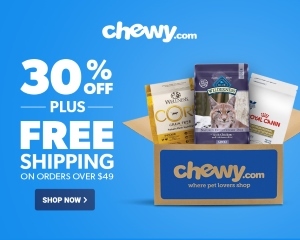 It’s an interesting concept, especially considering the risks associated with strapping a strip of toxins around your cat’s neck, but it’s seriously flawed. There’s no reason to think that ultrasonic flea collars work. In one study, even increasing the collar’s frequency output by 6,000 times did nothing to alter flea behavior. That doesn’t mean that anecdotal evidence hasn’t kept these noisemaking collars alive. If you do choose to take a gamble on an ultrasonic collar, know that one of these will set you back around $40. Do flea collars work – and are they safe for cats? Flea collars for cats are often thought of as the easy way to treat a parasite infestation. Because they’re often cheaper than other flea treatments, flea collars are easy to buy. They’re also easy to put on. Some cats don’t like the feeling of a spot-on applied to their back and many refuse to accept an oral pill. And it’s particularly rare to find a cat who accepts a flea bath. Compared to these alternatives, flea collars are a simple choice with a high rate of what manufacturers call “owner compliance”. But there’s another side to the flea collar story that’s much uglier – as ugly as raw, hairless skin around the neck. As ugly as children being exposed to dangerous concentrations of neurotoxins. As Mr. Kissin reminds us, all chemical flea treatments are inherently dangerous. You can’t avoid some degree of risk, whether you’re flea bombing your house, shampooing your cat, applying a topical, or using a flea collar for cats. Flea collars are one of the worst choices for treating your cat’s flea infestation. Here’s why. Whether they’re infused with insecticides or not, collars are always a risky choice for cats. Even if you adjust it correctly, choose a breakaway collar, and give your cat the right size, wearing a collar puts your cat at risk for choking or worse. The collar could catch on something while your cat is exploring. Flea collars often contain insecticide chemicals that are more dangerous than those found in other flea treatment products. More than any other flea treatment, flea collars have been implicated in reactions including seizures, rashes, and death. 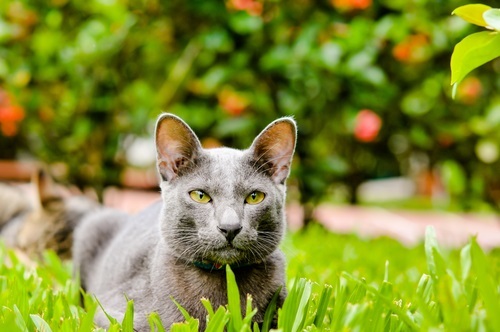 Flea collars are most often made with tetrachlorvinphos, proxopur, and permethrin, all of which pose serious health risks to both cats and humans. Negative reactions are unconscionably common. Many cats have allergic or chemical reactions to the plastic resins or insecticides that flea collars are made from, causing rashiness and blisters around the neck along with itchiness and soreness all over the body. Flea collars cover your cat in insecticides that could make you and your family sick. While these products are legally sold in many regions, they’re not universally accepted. In 2012, the French Agence Nationale du Médicament Vétérinaire watchdog group withdrew the permit for the sale of certain flea collars containing organophosphates, a group of toxins that exist in some of the most popular over-the-counter flea collars for cats. Organophosphates banned from sale in France include Dimpylate (or Diazinon), Propoxur, and Tetrachlorvinphos. 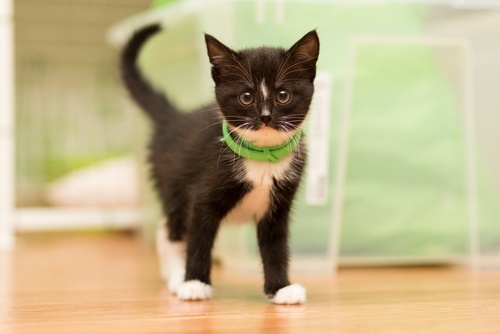 Flea collars are a particularly dangerous choice if your cat shares the home with infants or toddlers, who are particularly susceptible to neurotoxin poisoning. Besides being risky for your cat, flea collars could also make the household humans sick. A health organization called the NRDC has released a damning report on the effects of flea collars for human health. After just three days, 100% of cats wearing proxopur-based collars had enough residue on their fur to pose a neurological risk to toddlers who had a lot of contact with their pets. The study also found an increased risk for cancer for both adults and children exposed to proxopur. Remember that it’s critical to read the label carefully. Avoid flea collars and other flea treatments made for dogs, which often contain permethrin. This is a highly-concentrated synthetic insecticide that can make your cat seriously ill. Note that your cat could also become sick from contact with a treated household pet, so it’s important to think of everyone in the home when choosing a flea treatment. So should you use flea collars for cats? Most veterinarians agree that flea collars are at once more dangerous and less effective, on average, than other flea treatments. Click here for a useful directory of some of the most popular flea treatments on the market. All this having been said, there is just one flea collar for cats that has a good reputation. This absorption-based flea collar stands out from the crowd with its use of flumethrin and imidacloprid, two insecticides with a reputation for safety. Flumethrin is a synthetic pyrethroid that repels fleas and ticks. Imidacloprid is a neurotoxin that spreads through your cat’s body and targets the flea’s central nervous system. The insecticides attack fleas on contact, so no biting is necessary. The Bayer Seresto flea collar also appears to be relatively safe for use around children. By almost all accounts, the Bayer Seresto flea collar has long-lasting and thorough insecticidal properties. The Bayer Seresto collar’s non-greasy feel, effectiveness, and reputation for safety comes at a price. At over $50, the collar is more expensive than most. On Amazon, the Bayer Seresto flea collar for cats and kittens has 4,789 reviews and a 4.1 out of 5 star rating. 67% of these are 5-star reviews – indicating that the majority of customers were extremely pleased with their experience. 1-star ratings account for 16% of all of those reviews. 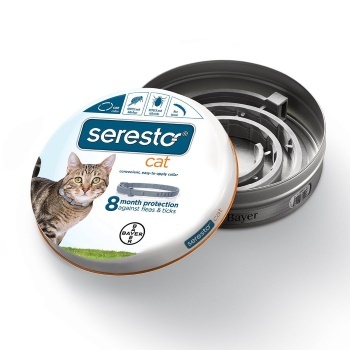 Despite its superior reputation, even the Bayer Seresto flea collar for cats comes with a handful of negative reviews and reports of toxicity. Considering that thousands of cats use this top-selling product, these claims may result from coincidence and assumption. It’s impossible to guarantee that your cat won’t have a sensitivity to the ingredients in any product. Whether you choose to use a flea collar or not, remember that the war on fleas has multiple fronts. Remember that only about 5% of the infestation lies on your cat’s body – the rest of it is squirming in your carpet or pupating between your couch cushions. Considering the unique life cycle of the cat flea and its ability to remain dormant for up to a year, treating a flea infestation requires a combination of aggression and tenacity. Devising a complete anti-flea strategy involves targeting fleas both on your cat and in their environment. While slapping on a flea collar is advertised as a simpler way to stop fleas, the truth is that doing so leads to slow results, comes with a high risk of toxicity, and is sometimes completely useless. There are many other options on the market, and many are far more effective than a flea collar. Click here for our comprehensive guide to the best cat flea treatment.